Foodprint – Handprint !? any questions !? http://www.handprint.in/abouthandprint. GOOD NEWS ! finally the broader thinking is picked up. I will send Owen this blog and so maybe we can discuss a wider Use and Meaning of the word “Mindprint” and maybe have him include next time also “handprints” ! His theme is very close to me – we discussed in Geneva with his collegues from WWF and many others around the GYC conferences in Geneva, so it looks like kindred thinking and wording is comming up. I recommend his lecture very much but regarding lifestyles, diets, ways of thinking and acting collectively much more is already on the road, even more than presented by the Sustainable Consumption Institute, which fully resonnate with. It is good that we finally adress values and how they connect on the suface and in the deep. So I will also include the link to our SURVIVAL ACADEMY “CopenVegan“ performances and event in Copenhagen at the UN Climate COP15. So I feel we should not talk about a failure of Copenhagen, but of how we engage all stakeholder, how we exercise the International Conferencing and Convention Circus, with some do only their “conference hopping” avoiding to listen and share “handprints” and “mindprints” of others…. I can also recommed this as we have to do some more “mindreading” soon ! HIGHLY RECOMMENDED !! 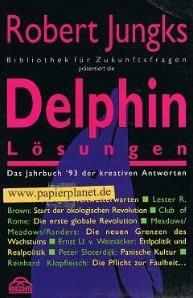 In a discussion after Rio+20 last week I remembered the Project Dolphine Solutions. And now in retrospect I feel it was the original and first book I know on Mindprints. How better to explain what mindprints are and can do, than to revisit the book!! The Robert Jungk Library in Salzburg was asked in the early 90ies to identify solution which are smart and can make a difference ! I contacted the publisher Peter Spiegel and we had lots of interesting discussion about what are such contribution that matter, that “bend the trend”, and reach higher plateaus of beauty, harmony, awareness, service,… and tackle issues which are overwhelming or we tend to ignore anyway, if not someone creates enough drama to alert us. I recommend the book ! Check it out !! But this is now 20 years ago ! What would be my proposals for a new edition today ! ? and who could help in a large team? to collects the best and the brightes ideas! Michael Braungart speaks about Solutions that make you feel good and eager to contribute and serve, combining quality and with beauty instead of making people feel guilty because they polute or because they are to many already. Solution where you can make a difference. The Thing from ZERI (Gunther Pauli) is learning from Nature and Others by being smarter, using “intelligent” and “wise” solutions often adopted from nature and avoiding the old think, exploring Mindprints ! We recently made some experiments in the Cradle2Cradle Fesrtival and Exhibition in Berlin, maybe start here: http://www.cradletocradlefestival.com/ to check the Open-Forum C2C event. ZERI is well covered in the Youth-Leader Magazin, enjoy “MEGA Solutions”: “its all there“. Of utmost concern is to me the fixed mindset of academia and administrations, our science paradigm. In the last 20 or 50 years we have done immense overclaims and oversimplifications, do every day new tech-fixes when we should better rest a moment and check the Problem and Solution Spaces. The Complexity and Dynamics of the living System Earth and our Social- and Cultural Systems and their interaction is so overwhelming that we should better check if we know the frames of references and the elements involved. The present climate research and management hype leads to solutions like focussing on one element or “possible cause” or one technology like engines, without looking deeper and maybe revisiting other cultures or other “sciences” Extreme examples are for me the neglect of the soil-water-vegetation-athmosphere nexus by people who did not study the “original” Ecology, and that there is not only a shortage of oil, but phosphor and other ways like Terra Preta are tested over centuries to not only address the problems of sewer systems and drinkign water shortages, but how to do natural bio-carbon sequestation and coem to rich soils. I will only mention to names here: Prof. Wilhelm Ripl and Dr. Haiko Pieplow. Both in Berlin but with international work and contacts to address with other mindsets critical global issues. Maybe check me mentioning them at GYC 2010 and GYC 2011 – in preaparation for Rio+20 .. I have repetedly presented at Global Youth Conferences and the results have been always delivered directly to people in charge not only in the UN, industry, NGOs,.. who is reading anymore? 4) looking into old and new paradigms, solutions, good news, …. 5. Infomation Harmonization and Open Repositories world be my next “5 cents”… if only people would listen, read, question, and so building and attention ecology and deliberating and co-creating beyond the need to agree. But there we are at No 1 above, in circles…. 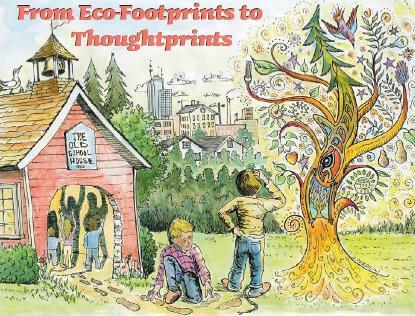 “From Footprints to Thoughtprints: Changing what we do by changing how we think !” by Stephen K. Goobie. Very close to my think and work spaces so not wonder there is great synchronicity and common mindprints – or thoughtprints abound. It was published in Green Teacher ! Winter 2011 and Mother Pelican already in May 2011. The greatest surprise is to find it in the same volume of Mother Pelican, paper 5, right before my contribution: Ignorance or Compassion? But now I am convinced you can use both terms and maybe we can learn from its uses and start a dialog on what can be done with shared “prints” – patterns and schemas we create beyond the real and the already agreed. I recommend IGNORANCE or COMPASSION? Limits and potentials of human concepts, maps and models with regard to nature , published in Ecological Awareness: Exploring Religion, Ethics and Aesthetics (Studies in Religion and the Environment) LIT publishers. Here more on the book and the articles “evolution” from: Missing Context in Modern Times, Outlining the Problematique of the Human Predicament and sharing Commons in a global Embodied Covenant, International Conference on Ecological Theology and Environmental Ethics, ECOTHEE, Orthodox Academy, Crete. See also work in 1996 outlining such a thinking and modeling in and around the communities working on Creativity & Cognition and Visions and Design Conferences and how this is based on earlier work on metaphors (1994) and later on analogies and agents (1998). We have worked in the 90ies on T-personalities, lateral and diagonal thinking, mindscapes and a mind-book and how to augment the human intellect to be better able to share the new challenges of Cyberculture and Globalisation. Please come back as we will provide here some references. Mindprint is about much more than just physical print-outs. It is about including the manifestations and representations, senses and sign systems, because using only one “channel” or one way of perception or expression is not enough and definitely not how living things work, eat, breathe, and exist. It is about resonating with oneself and others and all living and material things. As times are busy and critical we have little time to review and rewrite all that already been done. This new book or internet portal is not about re-inventing the wheel but trying to help to connect, co-create and expand what has been done to be better able to tackle the challenges we face. Earth Charter and an Embodied Covenat (See this Tagore-Einstein presentation), called also a House of Eyes (Horizons and Perspectives), a World-House (Welthaus), or a common construct between Oikos, Ecumene, Ecudomy, Ecumenopolis, Ekistics and Eco-Cube, Ecology and Economy. For more see ECOTHEE in Bamberg and Chania and “Our View of Life is too Flat”. So why do we speak about mindprints? We have to revisit the whole system, not only what we consume and produce ! We need to check where we can be afluent and serve, contribute not in a single slot or box, but serving a bigger picture. When focussing only on the consumption (footprint) and efficiency (handprint) we are missing something. We avoid being more creative and productive if we only optimize known processes instead of also looking into other ways and means. So another culture, technology, paradigm, form of living and enjoying, might be much more “productive” as it is a positive agenda, not only making less polution, but also creating other levels of quality and beauty. By blaming people and making them afraid and feel guilty we are not achieving desired goals in the field of sustainability. We have to set examples and give people a place they can enjoy and contribute, also serve, as in situations where “the more the give the more you have”. We just have to go beyond “counting” beans and blaming others. A mind-set-reset, a look into our mind-maps and thinking stiles, our approaches and ways to support and help will show that too often we are lost in sweet isolation and so avoiding anything strange or mind boggling, anything where we are emotionally and intellectually overwhelmed. Sorry some of the articles below are not available in English: (We are working on translations) – http://benking.de/hagia-chora2005/english.html – http://benking.de/play/IPA-Benking-PANORAMA.htm – http://benking.de/systems/oikos-bamberg-Dateien/frame.htm – http://benking.de/cob-paris.html – http://benking.de/dialog/r-benking.html – http://www.inst.at/berge/virtualitaet/benking.htm – http://benking.de/gebser2001.html – http://benking.de/futures/Benking-ECOTHEE-2008.pdf – http://benking.de/religion-ethics-ecology/ECOTHEE-2008-Dateien/frame.htm – I recommend IGNORANCE or COMPASSION? I just remembered that the key publication on mind bugs from 1990 is by Kurt Van Lehn and called Mind Bugs: The Origins of Procedural Misconceptions. It focusses on how we “aquire” a systematic bias towards errors and misconceptions in school, higher education and life. We call it “systematic errors” — or a cultual bias — which can be adressed in terms of standard deviation or normal distribution or, on the other hand, natural variance, another category Carl Friedrich Gauß was concerned with… So we have here a systemic bias from outside, from the way we learn, how the cultures make us think in certain ways, and how to possibly identify and avoid such bias. So back to Warfield: Typically John creates a new terms and axioms for new Sciences, he was an analytical deep mattermind in the field of complex systems: See here his Science of Mindbugs: MENTOMOLOGY – THE IDENTIFICATION AND CLASSIFICATION OF MINDBUGS. Warfield twenty-five mindbugs before 1995 and “classified them into Mindbugs of Misinterpretation, those where concepts are misconstrued or misattributed, because of faulty interpretation, Mindbugs of Clanthink: those where – concepts are very widely perceived to be correct, – but which are demonstrably incorrect, Mindbugs of Habit: those which involve ingrained behaviour, evinced with essentially no conscious thought, and Mindbugs of Error: just plain mistakes. Warfield was aware that it is not always possible to consign a mindbug to just one category. “Later refinements may allow this flaw to be corrected” he mentioned. PLEASE TAKE NOTE: Warfield is not just writing “Clanthink” in contrast to for example “Groupthink”, Spreadthink, and Linkthink: ,.. and is building on the work which started more than 40 years ago with the first two reports of the Club of Rome which were obviously not understood at those days and are seldom revisited…. And not to forget, these approaches are used today to see for example the 15 Global Challenges for Humanity by the Millennium Project in perspective, exploring deep and unconscious drivers and roots. Instead of looking back we experience that the next generations of scientists seem to be creating always their own, often appealing systems from scratch, unfortunately reinventing the wheel, maybe this is another omnipresent “scientific” mindbug John would consider for inclusion <sik>. Here is John Warfields original full text introducing MENTOMOLOGY. Without getting into the difference from, and the relation to, other forms of “thinking” there is little chance to get to know Warfield and collegues like Alexander Christakis and Walter Bogan and so really appreatiate where they have been years ago…. A Mindset, Mindbug, and MindPrint is a statement which needs to be seen in relation and in common frames of references. Words can be in the way when you search for meaning, practice and peace…..
New information is comming in: I was lead to The Mind-Bugs Taxonomy by Larry J. Bloom 2011 His term Mind-bugs™ is a metaphor for how our brains can unconsciously influence and support bad decisions. How we gather information: Sufficiency and Accuracy and how we process information: Beliefs, Social Cultures. The questions behind the surface understanding: Do I have the correct inputs, are they truthful? Or, on the reasoning side: How do I value and “colour” my decisions?, or what is the influence of others? These questions are very helpful but leave out a very important aspect: The Mindsets, Mental models, Conceptual Superstructures, specially when trying to combine competences for the close and the distant across sectors and times ! This is where I feel we need to go into Mindprints ! We have now years of discussions in the Wikipedia about Mental Spaces and Mental Models — a boring task because it is hard to find agreed upon definitions for the basics such as “What are Spaces?” or “What are Models?”. We therefore insist on having greater depth in the International Encyclopedia of Systems and Cybernetics, as there we have footnotes to the definitions of subject areas. Maybe you even like the overlap of meaning in Cognitive Spaces? http://benking.de/systems/encyclopedia/newterms/#_Toc87362165 This creation of extensional embodied meaning spaces is what I am aiming at with panoramic or spectrum thinking (shades) – see the general model theory and neo-pragmatism of Herbert Stachowiak and his “big brother is watching” – and how this can be understood – build – shared not only between 2 points but in 3-dimensional spaces and the combination of reference spaces (across scales). Without build/modelling and jointly exploring situations – we called it long ago situations spaces – we get lost in wording and culture clashes. So here we are getting to Mindprints – maybe to give it another word – call it Cognitive and Tangible Mental Models. I do not care. Important is the joint negotiation to overcome some of the mindbugs – specially when different scales and cultures are involved… (I KNOW THIS FOOTNOTE is a little much – but it evolved, sorry – same as the the term Mindprint – at a table – in dialog and looking at issues from all positions and ends, as a process of doing, not labeling! ).